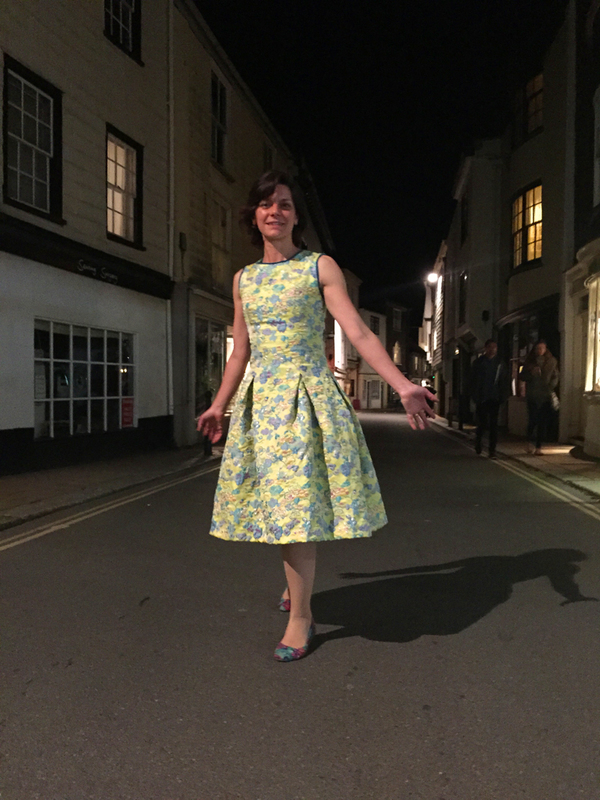 Lulu wearing her Tom and Linda Platt (Vogue 1348) yellow and turquoise poly/lurex brocade dress, made by Jane. The pattern has box pleats with bizarre instructions (Jane followed them once then did the rest her way). It has a concealed zip, silk underlining and velvet ready made piping around the armholes and neck. There is a petticoat in turquoise cotton poplin which is trimmed in lace. There are a million pieces to this pattern and so whilst it was not particularly difficult make (especially when ignoring the box pleat construction) it took a long time to cut out all the pieces. This dress needs a fabric with a certain amount of bounce to it and this brocade worked a treat. The petticoat has ruffles and lace trim galore but the skirt hoops out all by itself.